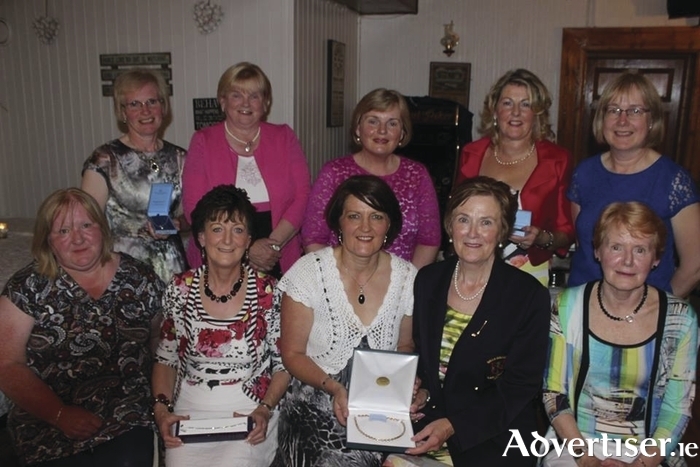 Ladies' winners: The winners at the Balla Lady Captain's prize recently. Back row: Aine MhicSuibhne (fifth), Geraldine Kilgallon (sixth), Helen Byrne (eighth), Mary Gillard (fourth), and Breege Jennings (seventh). Front row: Patricia Conwell (third); Mary B Prendergast (second), Gabrielle Cleshan (first), Patricia Larkin (Lady Captain), and Geraldine O'Malley (gross prize winner). Last weekend's rumble competition was won by the trio of Aine MhicSuibhne, Aodan MacSuibhne, and Mary B O'Donnell who scored a combined total of 83pts, second place went to the duo of Adrian O'Connell and Pat Mohan. Another trio came home in third place, with that prize going to Julie Loftus, Mary Lavin, and Aisling Prendergast. This weekend's competition is a stableford event. The club open week will commence on Monday July 27 and will run until Monday August 3, a great week with a number of competitions lies in store. John S Staunton was the winner of the gents' stableford competition with a score of 40pts, the gross prize went to Daniel Merrigan, with category wins going to Frank Burke, Noel Ansbro, and Gerry Scully. The front nine was won by Vinny Larkin with the back nine prize going to Ger Fahy. The ladies' competition was won by Louise Cribben with a score of 40pts, Maura Joyce came home in second place and Geraldine Ryan finished in third spot. Sheila Molloy finished in fourth spot with the front nine win going to Ann Treacy and the back nine to Eileen Comer. The gents competition was won by Tadhg Buckley with a score of 45pts, he finished five points in front of Tommy Moran in second place with Gareth Delaney finishing in third place. The ladies competition was won by Laurena Freeley with a score of 34pts with Anne Freeley finishing in second place. The junior prize went to Andrew Hickey. It was a good weekend for Curraun golfers with David Ryder and Brendan Patten claiming first and second places in the Albany Home Decor singles versus par competition. Ryder's score of four up saw him over the line ahead of Patten's score of three up. Jack O'Hara finished in third place with a score of two up. This Sunday is Captain's Prize day and Rod Wood's big day promises to be an exciting day's golf. There will also be a ladies' nine hole competition on the day. Last weekends gents competition was won by Jim O'Donnell who scored 41pts for his round, second place went to Kevin Quinn with Gerry Roynane finishing in third spot and PJ Heneghan in fourth. The ladies competition wa won by Patrica Feeney who shot a round of 69, second place went to Anne McNeela with Catherine Loftus finishing in third spot. The Jim Lyons memorial competition was won by C McGettigan and P Bree, second place went to J Connolly and A Guiry, and third place went to J Keane and R Barry. This weekend it is Padraig Kennedy's big weekend with the Captain's Prize down for decision. The event will take place over this Saturday and Sunday.